New Flyer of America Inc., the U.S. subsidiary of New Flyer Industries Inc. (NFI Group), announced that the New York City Metropolitan Transportation Authority (MTA), acting through the New York City Transit Authority (NYCT), will launch its electric bus test and evaluation program of five Xcelsior CHARGE™ battery-electric, 40-foot heavy-duty transit buses. The program will begin January 2018. The program introduces leased zero-emission buses and rapid chargers to the NYCT network and supports New York’s commitment to protect the environment, reduce emissions, and fight climate change. The MTA will use program results to refine and develop requirements for future electric bus procurements, and to also ensure buses are fully able to meet the rigors of operating in New York City. For the program, New Flyer integrated leading battery technology from XALT Energy with high-efficiency electric motors and rapid overhead charging systems from Siemens. The electrical infrastructure is being assembled at Siemens’ Tualatin, Ore., rail electrification facility, and the integration of the technologies produced the most technically advanced transit bus in the industry. New Flyer also partnered with Black & Veatch, a leader in engineering and construction of complex charging networks for fleets nationwide, to deploy the high-power charging infrastructure both on-route and in the depot. The program will operate across the NYCT system, with the option to rapidly recharge buses at either end of the route. The on-route rapid charging system used by New Flyer and Siemens allows battery-electric buses to operate continuously without returning to a depot for recharging. 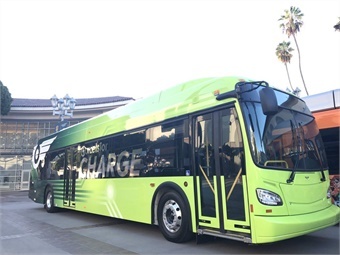 Similar New Flyer buses and charging systems are anticipated to follow in Los Angeles, Portland, Salt Lake City, and Boston in 2018. The MTA is North America's largest transportation network, serving a population of 15.3 million people in the 5,000-square-mile area from New York City through Long Island, southeastern New York State, and Connecticut.